Midgley United powered into an eight-point lead at the top of the Haslem Sheppard Halifax AFL with a comprehensive 8-1 derby win away to Calder ‘76 on Saturday. Rock bottom Calder had hopes of an upset when star striker Remi Allen gave them the lead midway through the first half but goals from Rob Stansfield and Richard Vile gave the Holmes Park visitors the lead and Midgley ran away with it in the second half. George Bamford hit the bar for Midgley after 15 minutes but Allen scored with a header in the six-yard box after a cross from Calder’s right. Calder got on top for a short spell after that but Stansfield equalised from an acute angle after being first to react following a save and Richard Vile gave Midgley the lead with a good finish. Midgley boss Craig Gee admitted he was not expecting an 8-1 scoreline at that stage but a few adjustments worked a treat for the visitors after the break. Stansfield got his second with a back post header following a quality cross from Andrew Butterworth, who then made it 4-1 after 55 minutes. Allen’s runs from deep caused Midgley a few problems after that but it was largely one-way traffic with Dan Vile and Butterworth extending the lead. Substitute Sam Tattersall applied a back post finish to another cross from Butterworth, who completed the scoring from the penalty spot at the death. Long-serving striker Karl Jowett struck twice as Greetland beat Denholme United 4-1 at Goldfields in the other Premier Division contest. Tom Wall and an own goal accounted for the rest of the home side’s tally and Richard Wear replied. Greetland shot up the table from eighth to fourth. Illingworth St Mary’s got back to winning ways in Division One after a poor run with a hard fought 7-4 victory away to Brighouse Sports. Games between these sides have historically been entertaining and this was no exception. Saints took the lead early on through the returning Joe Griffin, only for Brighouse to hit back instantly with a disputed penalty. Sports then took the lead with a back post finish. Gareth Gaukroger pulled Saints level just before half-time from close range. Brighouse regained the lead again just after the break with a great finish from Nathan Hirst before a pinpoint Jamie Moorhouse cross found Phil Livsey at the back post and he powered a header home. Illingworth hit a purple patch and added three goals in five minutes through Gaukroger, Scott Hamilton and Brandon Field. There was just time for Gaukroger to complete his hat-trick before Hirst added his second for Brighouse. 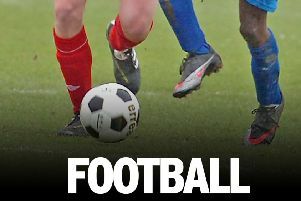 Ben Attle struck five times for Elland Allstars in a 6-1 win over Holmfield, who were returning to action after a break of a month. Tom Chappell got Allstars’ other goal and Des Morris struck for the visitors at Goldfields. Bailey Naylor scored eight goals as Division Two leaders Crossleys steamrollered more opponents, this time hosts Illingworth SM Reserves by 13-2. Five other visiting players scored once each and Matthew Crowther and Jack Pullen provided the crumbs of comfort for Saints on the Trinity Academy 3G. Greetland Reserves lead the fairly distant pursuers, going second with a 3-1 win away to Sowerby Bridge Reserves with John Wilkinson the home scorer. Shelf United Reserves joined Greetland on 15 points thanks to two goals apiece from Daniel Able and Bradley Etheridge in a 4-3 home win over Stainland United. Bottom side Northowram Reserves picked up only a second point of the season in a 1-1 draw away to Midgley United Reserves. Elland United are the first side through to the semi-finals of the Covea Insurance Invitation Cup after a 7-1 mauling of visitors Warley Rangers. Vaughan Boon and Mark Kelsey scored two goals each for the Division Three leaders. Shelf FC Reserves and Sowerby United Reserves moved through to the final eight. A hat-trick from Bradley Osborne helped Shelf beat Flying Dutchman 4-2 at Savile Park while goals from Lee Barber, Alex Haggerty and Micah Turkaly gave Sowerby victory over Hebden Royd Red Star Reserves at Ryburn Valley High School.